Canadian poet/singer/songwriter Leonard Cohen is on a roll these days after going through some tough times. His song, Hallelujah, has iconic status. Every Canadian, it seems, has his or her favorite cover version. I love Rufus Wainright's, but there are other great covers, including a new one by the latest winner of Britain's X-Factor television talent contest, Alexandra Burke. Consider this my Christmas card to For Your Approval readers. Happy Holidays! 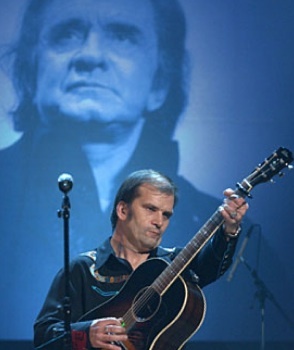 I just watched a wonderful tribute to Johnny Cash on CMT, with Johnny's friends and family, including Steve Earle, Kris Kristofferson, Emmylou Harris, Willy Nelson and many others singing his songs at Nashville's Ryman Auditorium. I'm a complete sucker for this kind of stuff and I was blubbering away as usual. Thinking about Johnny and his huge influence on contemporary music and popular culture, I realized that his songs, and his spirit, represent an attitude that many employee communicators have. Like the Man in Black, we care about people who don't have a voice. We understand the many failings of humanity, and of ourselves. We sympathize. We build bridges between people. Sometimes we even thumb our noses at authority. Johnny Cash is one of the best examples I know of someone who did something truly meaningful with his life. He continues to inspire me to try to make a difference. Right now I'm trying to decide what my favorite Johnny Cash song is, and, although I love his latter-day interpretations of modern songwriters' work like "Hurt," I'm pretty old school. I'd have to go with Folsom Prison Blues, or maybe Get Rhythm. "...the guardians of our cultural voice. The Internet is their CBGB. Their territory is global. They will dictate how they want to create and disseminate their work. They will, in time, make breathless changes in our political process. They have the technology to unite and create a new party, to be vigilant in their choice of candidates, unfettered by corporate pressure. Their potential power to form and reform is unprecedented." Tomorrow's employees will have similar powers. They'll just be a bit longer coming.